This charming house is located in Campos, has a private pool and a garden and is ideal for 10 guests. You will have access to a 10m x 5m private chlorine pool with a depht between 1.1m and 1.8m. Surrounded by a garden and a terrace with eight sun loungers, it’s an idyllic spot for sunbathing. Furthermore, there’s an exterior shower. If you love cooking outside, you can use the barbecue. Next to the BBQ area there’s a furnished porch and an exterior shower bathroom. At the entrance of this two-storey house there is a porch on each floor. This coquettish home is located in a small urbanisation with several neighbours. The lower porch gives access to a cosy sitting-dining room with satellite-TV and a well-equipped kitchen with vitro hob. Furthermore, there are two bedrooms, one with double bed and one with two twin beds, as well as a bath with bath tub on this floor. The laundry room has a washer, an iron and an ironing board. A staircase leads you to the upper floor and to a rustic sitting-living room with open, well-equipped kitchen with vitro hob. There’s another, stylish dining room with access to a furnished terrace. On bedroom has a double bed and the other two single beds; the bathroom on this floor is fitted with a bath tub. We can provide you up to two cots and high chairs upon request. This house features five fans. Please keep in mind that there’s a charge from the sixt guests, per night and person. 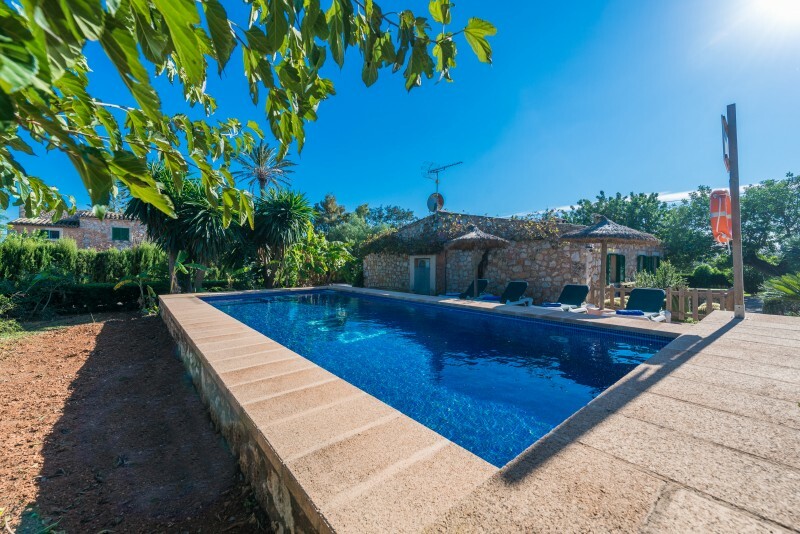 This coquettish cottage is located about 2 km from the genuine village of Campos, where you will find everything needed for an independent holiday. Thursdays and Saturdays you can buy fresh fruits and vegetables at the market. A 20 minutes’ drive takes you to the wonderful natural park of Mondragó with Mediterranean woods an two sand beaches. The east coast is known for its beautiful beaches like Caló des Moro, Cala Llombards, Cala Santanyí and Caló Marmols. Southwards there are the natural beaches of Es Trenc and Ses Covetes. If you like playing golf, you can practise the perfect tee-off in Vall D’Or. The fireplace can not be used. Pets up to 15 kg are allowed, but please keep in mind that we accept only 1 pet. There is covered parking space for 2 cars. Wir waren zu sechst in der Finca. Es gab reichlich Platz und alles war blitzblank. Mit dem Mietwagen konnten wir Strände und Einkaufsmöglichkeiten in 5-10 Minuten erreichen. Der Pool war super und die Kommunikation perfekt! Es war ein toller Urlaub! Vielen Dank! Definitely a place to come back! Great place to stay if you really want to disconnect and enjoy a peaceful time, close to really nice calas and beaches. Wir hatten eine schöne Zeit in der Finca, welche vor allem mit dem großen Pool glänzen konnte. Als wir einen Morgen nach einem Stromausfall kein Wasser hatten wurde sich super schnell um unser Problem gekümmert und Abhilfe geschaffen! Ansonsten ist die Finca gut ausgestattet und es gibt viele Ausflugs- und Einkaufsmöglichkeiten in der Nähe (mit Auto zu erreichen). A beautiful farm house with lots of room a perfect place to have a relaxing stay with a family. Beautiful house with lots of room both inside and out. Very clean, lovely big swimming pool we had a wonderful time here with our family. A small dislike - It's quite difficult to find the turn off to the property in the dark off the main road. Enjoy the wake up calls from the birds. Die Finca bietet viel Platz auch für größere Gruppen. Sie ist toll geschnitten, hat 4 Terrassen (3 davon überdacht) und könnte auch gut in 2 getrennte Wohnbereiche aufgeteilt werden für z.B. 2 Familien, die zwar gemeinsam Urlaub machen, aber auch etwas Privatsphäre haben möchten. Ein absolutes Highlight stellt natürlich der Pool inkl. Außendusche dar, der schon vor dem Frühstück zum Schwimmen von ein paar Bahnen einlädt. Leider sind viele der Möbel ziemlich abgewohnt und an manchen Stellen zusammengewürfelt. Es mangelte zudem während unseres Aufenhaltes an Auflagen/Sitzkissen für diverse Terrassenmöbel und Poolliegen. Auf Nachfrage wurde kommuniziert, dass ein Teil wohl derzeit in der Wäscherei wären. Trotzdem für uns natürlich sehr schade, das sich ein Teil so einfach nicht nutzen ließ. Generell war die Kommunikation mit Villafinca sehr gut. Alle Nachrichten wurden umgehend beantwortet. Das Anwesen ist sehr verkehrsgünstig gelegen, allerdings nicht allzu weit von einer gut befahrenen Straße entfernt. Daher ist es hin und wieder etwas lauter. Auch der aktive Hahn der Nachbarn ist nicht gerade der ruhigste Zeitgenosse. Sowohl Campos als auch Santanyi mit diversen Einkaufsmöglichkeiten sowie Märkten sind innerhalb weniger Minuten zu erreichen. Die Anbindung an die Autobahn nach Palma ist sehr praktisch und auch die Strände des Südostens sind zügig erreichbar. Alles in allem eine Finca mit sehr viel Potenzial, die aber hinsichtlich der Einrichtung etwas Aufmerksamkeit vertragen kann. Great place! Especially wit childrin. Easy communication. Clean and well organized. Highly reccommended. We will be back! Very big house with nice swimmingpool. Location is close to several supermarkets and restaurants. Also the local marker of Santanyi is really nice. The kitchen is not very big. Also some showers are a bit old and not easy to use (very small). A lot of towels in the house, which is very easy. We had a nice stay!